Hundreds of people packed the ballroom at the Four Seasons ballroom in downtown Seattle for the World Finals of the 2018 Imagine Cup competition. Hosts Kate Yeager and Corey Sanders paused. The crowd leaned forward in anticipation. They stomped their feet in a simulated drumroll. They had met the judges; they had heard from Microsoft CEO Satya Nadella and Olympic Gold Medalist Chloe Kim; and they had seen presentations from the three finalists. Over 40,000 students from almost 200 countries around the world had signed up for this competition, but only the top 40 teams were invited to the Seattle area for the finals. These teams represented 33 different countries, and each pitched their projects - a combination of hardware, software, and business ideas - to a panel of judges. The judges culled the field to 18 semi-finalists; then to 3 finalists and these 3 delivered their final pitches on Day 3.
iCry2Talk, a team from Greece that developed a system to analyze the crying of babies, determine what triggered the crying, and communicate that to parents via text, image, and voice messages. Mediated Ear, a team from Japan that developed software to help hearing-impaired people listen to a single voice in a room full of other voices and noises. SmartARM, a team from Canada that built a prosthetic arm with a camera in the palm, capable of recognizing images and positioning the fingers to pick up the item correctly on a muscle flex. And now it was time to learn the winner. A cheer erupted. Confetti flew from the ceiling. Music played. SmartArm consisted of Hamayal Choudhry and Samin Khan, students at the University of Ontario Institute of Technology and the University of Toronto respectively. I was especially pleased to see them take home the world championship. Months ago, I helped mentor them at a hackathon at the University of Toronto, where they won a prize for best use of Microsoft technology; and I've followed them as they put in countless hours of work and great ideas to advance their project to where it is today. 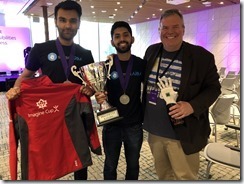 SmartArm took home the top prize - $85,000 cash, $50,000 Azure credits, and a mentoring session with Satya Nadella; but there were many winners beyond them and the other 2 Finalist teams. Many of the teams will return home to turn their projects into business. And many will inspire their classmates to compete next year. It was an amazing week filled with energy and ideas. The Last Enchantment by Mary Stewart's concludes the Merlin Trilogy begun with The Crystal Cave and The Hollow Hills. The story begins just after young Arthur's ascension to the throne of Britain. It covers Arthur's first decade as high king as he battles the Saxons and unites Britain. But Arthur is a minor character in this novel, as Stewart focuses on Merlin, the king's cousin, mentor, advisor, prophet, and friend. Arthur is betrayed by both his half-sisters; but we hear much more about Morgause, because she tries to poison Merlin than about Morgan, who steals the king's legendary sword. In The Last Enchantment, as in the previous novels, Merlin's mystical abilities are never as powerful as in the familiar legend; his abilities limited to his education, his wisdom, and the ability to occasionally see visions of the present and future. In this novel, he loses his clairvoyant power, yet retains his value to Arthur as a trusted advisor and mentor. Despite Merlin's power and stature within the new kingdom, he shows considerable humanity. He confronts the loss of his mystical powers; He confronts his own mortality and how the kingdom will fare when he eventually passes; and he falls in love for the first time in his life. He even deals with his accidental entombment after an Morgause's assassination attempt leaves him in a deathlike state. I loved this whole series. I loved Stewart's ability to take a story as familiar as the Arthurian legend and make it fresh and make it her own. 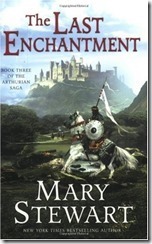 I loved the way she combined the different versions of the Arthurian legend into a coherent tale. I loved the humanity with which she injects all her characters - even those with special abilities. I loved the action and the politics and the romance. I loved the relationship and loyalty between Arthur and Merlin. I was fortunate to have discovered this series and I'm happy to have seen the trilogy through to its conclusion. 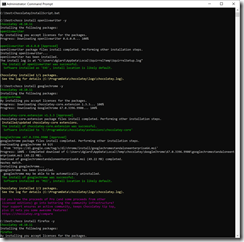 Azure blob storage is a good, inexpensive way to store files in the cloud. Putting some thought into how you will use this data will save you some money. Azure offers 3 tiers of blob storage access: Hot, Cold, and Archive. Your choice depends on how frequently you intend to access your data. 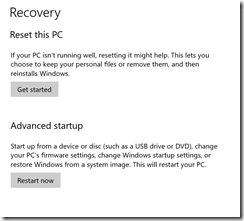 It is always free to upload data to Azure storage, but there may be a charge to retrieve data. Hot storage and Cool storage each offers easy, quick access to your files if you want to read or download them. The difference is the price. There are 2 components of Azure storage pricing: storage and data transfer. Storage is the fee for using space on Azure hard drives. Data Transfer is the fee to access your data (for example, you may want to download a copy of a file or point to an image stored in blob storage). Hot storage has higher storage costs, but lower data access costs than cool storage. So, if you plan to access your data a lot, Hot storage makes more sense; for infrequently accessed data, cool storage is cheaper. There is a third Azure Storage tier called "Archive" that is designed for long-term storage data that is accessed very infrequently. Archive tier differs from the other two not only in price - but in how quickly you can access your data. The storage price is much lower, and the access price is much higher than the other two tiers. In addition, it may take hours between the time you request your data and the time you can access your data. Hot and Cool tiers can be set at the storage account level, but Archive tier can only be set for individual blobs. As you can see, the costs can vary significantly. Your choice depends on how frequently you plan to access your data. If you want to store images to display on your web site, the Hot Tier makes sense. If you want to store customer invoice PDFs and you expect people to only review them every month or two, Cool is probably the best choice. If you want to back up your video files just in case your local drive fails (like I did), Archive is more practical, because I might never retrieve those files. As Azure evolves, these options become more and more driven by the demands of the customer. J.D. Vance was never a hillbilly. He isn't even from the hills. He was raised in the southwest Ohio city of Middletown - a rust belt town hit hard economically when a major employer left. But his family migrated to Middletown from rural Kentucky and displays many of the attributes of the white working class of Appalachia. These people, Vance tells us, identify as "hillbillies". 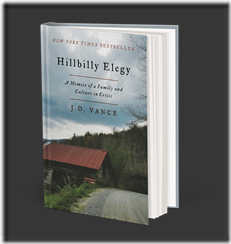 And in Hillbilly Elegy: A Memoir of a Family and Culture in Crisis, Vance describes the attributes of these hillbillies - sometimes through the stories of his own family and neighbors and sometimes through statistics drawn from studies and journals. Most of those traits are not good. The undereducated, underemployed whites with roots in Appalachia (read "hillbillies) are verbally abusive and prone to violence and share a feeling of hopelessness. They tend to believe that they are not in control of their destiny - that those who succeed were born to better circumstances or were just born smarter. To make matters worse, hillbillies are often dishonest with themselves. They are convinced that they work harder than they actually do and that they attend church more often than they really do. They distrust outsiders; they distrust the government; they distrust the press. These factors combine to keep them poor and exclude them from the American Dream. They do profess a fierce family loyalty, but only in the sense that they will attack any outsider who insults or otherwise threatens their family. They are generally not supportive of their own family and are often treat one another with cruelty. Hillbilly Elegy tells Vance's story of being raised by these folks, the effect it had on him and others like him, and how he was able to escape this culture and graduate from a prestigious law school. Vance's mother was a drug-addicted single mother, who marched through a plethora of boyfriends and husbands as he was growing up. He nearly flunked out of high school while growing up and many of his friends and neighbors got into trouble and/or made nothing of their lives. He was largely raised by his gun-toting, foul-mouthed grandmother (aka "Mamaw") and his grandfather (aka "Papaw"). Eventually, Vance graduated high school, enlisted in the US Marine Corps, earned a bachelor’s degree and a Yale law degree. Three things contributed to Vance's eventual success. Mamaw succeeded in instilling in him a willingness to work hard and improve himself. He enlisted in the US Marines right after high school, where he learned discipline and many of the life skills not taught to him growing up. He was accepted into Yale, where he learned the art of networking to achieve success. Hillbilly Elegy is an interesting story, about a man who overcome adversity by taking control of his life and rejecting his circumstances. But is also a social study of an American demographic that is often overlooked - the poor, white working class of Appalachia. These are people whose lifestyle is not well suited to adapting as the economy changed and felt left behind by the rest of America. This feeling of hopelessness may explain why so many of them shifted from the Democratic to the Republican party in less than a generation. I cannot speak to the generalizations that Vance makes about his people. My ten years living in Kentucky were mostly not spent among the very poor. But I don't doubt his personal experiences and how he was able to overcome his own expectations and his perceived destiny. And I appreciate that he made me think about a group of people in a new light. Guy Montag is a fireman. Unlike the world of today, firemen in Montag's dystopian near-future are charged with burning books. Books are illegal because books encourage free thought, which makes it difficult for the government to control its citizens. One day, Montag meets Clarisse, a high school girl who is not afraid to think about the world and question what she sees. Montag enjoys his conversations with Clarisse and is jarred when she suddenly disappears - an apparent victim of an automobile accident. Montag begins to question his life and the morality of his job. He courts disaster when he steals a book he is supposed to burn. Fahrenheit 451 is one of the great novels of the twentieth century. Not only is it a compelling story; it is a warning against anti-intellectualism and those who mindlessly follow authority. It is a warning of choosing comfort and vapid entertainment over freedom; and allowing power to be too concentrated. 65 years after its publication, these issues are still relevant. This is a book everyone should add to their reading list. It is a simple parable but packed with so much that I have read it three times.